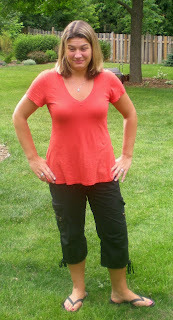 Life and Style by Lisa B: Orange jeans! Last week I bought a pair of orange jeans. Love them!! I have been struggling since to find a top to go with them. While I know there are lots of options, I just can’t seem to nail something down that I like. When it comes to colored jeans I guess I treat them as a neutral. You can wear just about anything as long as the colors match. Am I right here? So, orange jeans I could wear with a blue, tan, white, black, and maybe even a patterned top. I have been trying to avoid the orange and black combo because of the Halloween look. This morning I had the orange jeans on with a blue and white patterned top. It just didn’t look right to me. That option was out! Believe it or not I do not own a white t-shirt which is another easy option. I do however have many black shirt options. NO, I am avoiding the orange and black combo. In the rush of everything that meant that the orange jeans were not being worn today. Instead, I opted for a pair of black capri pants and a t-shirt. I got in the car and started to drive to work. I looked down at my outfit, which I had admired in the mirror before I left the house, and I realized I did the exact thing I was trying to avoid with the orange jeans! I am wearing black pants and an orange top! Maybe I wasn’t so critical about the outfit because the top and the bottom are both something I am comfortable wearing. Perhaps bright colored pants are something I need to get comfortable with! How do you all feel about bright colored pants? Does anyone else have a fear of the Halloween look or some other color combination that you won't do?